Kids' creative juices will flow when they hand-make The Froggie Game, but the variations on game play allow them to think outside the pond as well. In this printable board game, kids stack pennies on their markers as they move around the board. The one with the highest penny stack at the end wins! Take the Paper Airplane Challenge! This paper airplane challenge is fun for both kids and Dads alike! Try to send your paper creations through the "eye of the storm." Play the Pot of Gold Game! This free printable game is great entertainment with a St. Patrick's Day theme. Get the Leprechaun to the pot of gold first to win! On this multiplication board game, kids solve intermediate multiplication problems and move around the board, trying to pass as many corners as they can. Is your child an expert at multiplication? 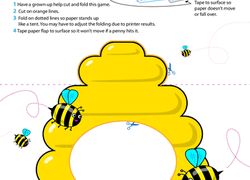 Find out with this fun, printable board game. 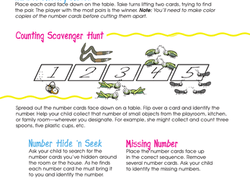 Make number and counting practise fun with number card games. Includes number cards and game sheet. Play this fun farm animal board game to help your preschooler practise vocabulary! Chock full of cute and colorful graphics, this fun board game is guaranteed to please your preschooler. Little race car drivers, time to rev your engines! This game will be great for your child to hone fine motor skills, and practise good sportsmanship. 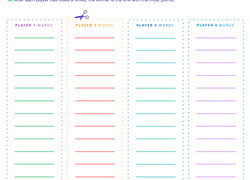 This year 2 printable board game packs a triple reading punch, improving spelling, expanding vocabulary, and building phonics fluency all at once! 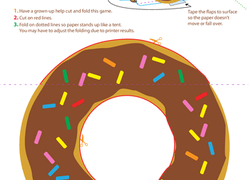 This delicious donut coin toss game will offer your child hours of fun. 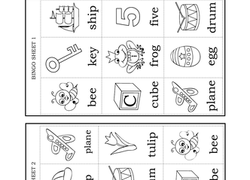 Just print it out, cut and fold along the lines, tape to a table, and start playing! It's zombies versus humans in this fun game that combines strategy with graphing practise. 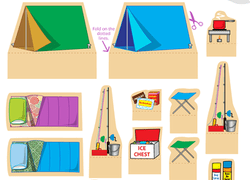 This camping worksheet is a fun and exciting printable board game. Whoever collects the most camping gear wins the game! Does your child love puzzles? Here's one you can print at home and cut out to make a homemade jigsaw set. 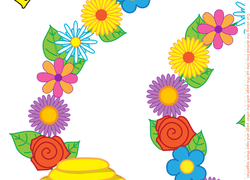 This activity helps your child build motor skills. Hey speed racers, rev up your family game night with a fun race car printable board game! Kids who love Valentine's Day will enjoy this love-themed tic-tac-toe game. Use these heart and bunny markers on the reusable tic-tac-toe board.